The incident with the aircraft has doubtless jeopardized relations between the two Eurasian giants. 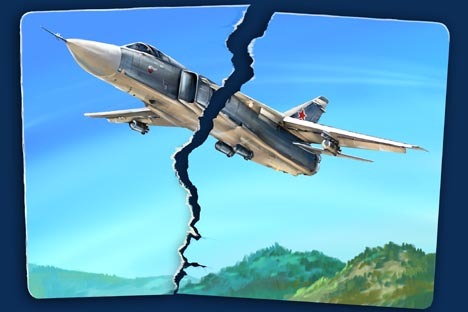 The incident involving the shooting down of the Russian aircraft by the Turkish Air Force will be a difficult test for bilateral relations between Moscow and Ankara. Until recently, politicians and analysts viewed them as an example of success in improving relations between the former historical enemies. Meanwhile, it would be wrong to consider the current problems as something which arose suddenly and for no apparent reason. Well-known Turkish expert Bulent Aras described Turkish-Russian relations as a "competitive partnership." Indeed, the views of Moscow and Ankara have not coincided on many political subjects. On either the Nagorno-Karabakh conflict and on Georgia, whose territorial integrity has not been questioned by Turkish politicians. Although Ankara did not seek to pursue the theme of Crimea, its attitude toward the change in the status of the peninsula in Russia's favour can be defined as cautious skepticism. However, both countries were able for a long time to narrow down their differences through development of mutually beneficial economic relations. It seemed that pragmatism would continue to overshadow the contradictions and debate on political subjects. The relationship of Recep Tayyip Erdogan, the last decade's leading Turkish politician, with the United States and the European Union left much to be desired. Ankara was not happy about Washington's relations with the Kurdish movements in the Middle East, while the movement of the Turkish Republic toward European integration did not meet much enthusiasm on the part of Brussels. The parties were unable to reach a breakthrough on the issue of Cyprus. In addition, the "Kurdish card" in Turkey also provoked debate within the European Union, about the advisability of bringing Turkey into the fold. Additionally, the Turkish Republic is the only NATO member country to have received the status of a dialogue partner in the Shanghai Cooperation Organization (SCO). In short, Russia and Turkey agreed to disagree on some issues, but did not cross the "red lines" and question the need for increased economic cooperation. This was evidenced by the preparation for the implementation of the Turkish Stream energy project, designed to reduce the dependence of the Russian Federation on Ukraine as a transit country for Russian gas. However, it is not in 2015 that the logic of an "agreement to disagree" began to break down. The origins should be sought in the events of 2011, when the so-called ‘Arab Spring’ came to West Asia. If Moscow saw this event as a dangerous challenge associated with the collapse of the secular state, the strengthening of Islamic fundamentalism and concerns about its export to the post-Soviet states and Russia itself, then Turkey saw it as a chance to return to the region, which Ankara for many years did not see as its priority. Hence Turkish support for the leader of Egypt's Muslim Brotherhood, Mohamed Morsi, a sharp turn to the criticism of Israel and political support of Palestine, and the struggle against the regime of Bashar al-Assad. Ankara actually made a claim for the Middle East as its "near abroad." As a result, the two Eurasian giants formed different political "optics." In Syria, Moscow sees Islamic State and the collapse of the secular state as the main threat, while Ankara fears the strengthening of the positions of the Kurds and the Alawites, and the defeat of its "clients," who are interested in the strengthening of the Turkish influence in the region. The incident with the aircraft has doubtless jeopardized relations between the two Eurasian giants. Each has both the prestige of the country, and its understanding of the prospects of getting out of the current situation at stake. The situation is fluid and will be changing and be refined. Emotions have reached the highest point both in Ankara and Moscow. Both countries do have some experience of getting out of such complex and almost deadlocked situations. Also, neither wants to help third forces by weakening each other. Turkey is well aware that, in spite of its dislike for Assad, destabilization in the neighboring country may boomerang on Turkish society itself. There is radical Islamist sentiment inside, whose carriers are ready to fight against Erdogan, regardless of his relations with Russia. Even by spoiling them, he will not get forgiveness and support from these people. All this provides a faint hope that the countries will find some modus vivendi in the new challenging environment. Sergei Markedonov is an assistant professor of the Foreign Regional Studies and Foreign Policy Department of the Russian State University for the Humanities. The opinion of the writer does not necessarily reflect the position of RIR.